June on St John is nothing short of stunning. Every fruit tree in our yard droops with heavy fruit and a different color flower is everywhere you look. It takes patience to wait until the sweetness is just right to pick. The real estate market seems to be the same; lots of low hanging fruit. There are more homes on the market on St John under $1 Million then there have been in recent history and buyers are snatching them up. Over all, these deals have dominated the first half of the year in an unprecedented way. If you are one of those buyers that has been waiting for the moment to get into the market on St John, this may be your time to finally buy that little villa you have dreamed of. It seems like the surge of smaller, more affordable homes may be linked to the short term market which remains incredibly strong. People have taken advantage of the ease of renting smaller homes and brought a new market to St John - the villa under $1M!! MARKET SUMMARY - All told, it remains a buyers market, but the inventory is moving at an increased rate. So far in 2017, 19 homes have sold and 16 are currently under contract. There were 11 land closings, 2 commercial and 2 condo sales. There are 8 lots currently under contract and 2 commercial listings pending closing. The Charts above show the last 10 years of sales data on residential properties on St John. 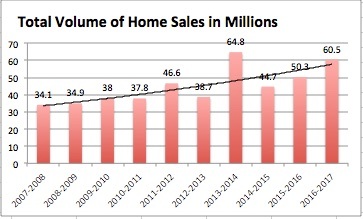 The volume and number of sales continue to rise, but the prices are going down. In the last 12 months, the average price of homes sold was down to $1.005 Million from a high of $1.604 Million in 2010/2011(June -June). However, the average price of homes sold in the last 6 months was a shocking $737,000, less then half of the 10 year high. 15 of the 19 sales in the first 6 months of 2017 were under $1M!! 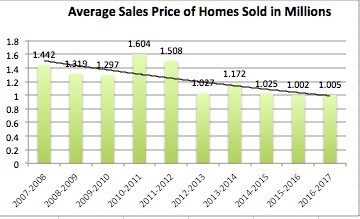 So why all the low sales and where did these cheaper homes come from? This is good question, when we bought our home 12 years ago, it was one of a couple of homes even listed under $1M. Today, there are 49 actively listed homes under $1M!! It seems like there was a combination of a few things to bring these homes to the market; sellers who have owned homes on St John for a long time are getting older, homes that were built cheaply during the boom years coming to the marketplace and homes that have been rescued from deferred maintenance to serve the insatiable short term rental market which are now marketable for sale and now have fancy things like "certificates of occupancy". Anyway you shake it, buyers have responded by snatching up these cheaper homes in a noticeable way. You can also try our advanced MLS tool to search on your own.